The Sorma Group's range has been expanded with an innovative artificial vision system installed in the proprietary calibrator, SormaTech. 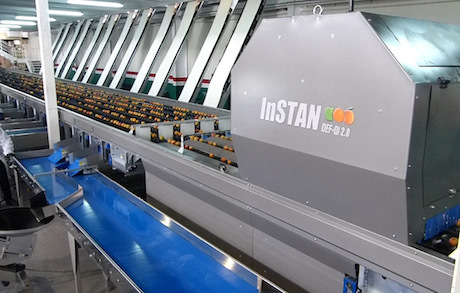 InstanDEF-QI 2.0 is the new software that the Cesena-based company will present in Berlin during Fruit Logistica (Hall 9 stand D-13); a fair that will be held from February 6 to 8. The new calibrator, which was created to offer the possibility of selecting fruit in an extremely accurate way, will allow the Group to offer every machine necessary to manage all post-harvest operations. "Investing in innovative machines means investing in your customers," says Daniele Fabbri, Managing Director of Sorma Ibérica. "The main objective is to offer our customers the most appropriate tools so that they can autonomously meet the demands of final consumers." In addition to having been remarkably simplified, the new interface gives the operator the possibility to modify and customize the defect detection options in real time. Thanks to the InstanDEF-QI 2.0 system, SormaTech is now in a position to define the quality of each fruit more accurately. By means of complex multispectral interlacing algorithms, devised by the research and development center of Sorma Ibérica, the number of images of each fruit analyzed has been doubled, thus allowing for a more effective detection of defects, both internal and external. At the end of the process, the product that reaches the points of sale will be presented in ideal conditions. "If the consumer sees one or several spoiled fruits inside a container, they could decide not to buy it," explains Daniele Fabbri. "So, it's not just a matter of productive efficiency, but a fundamentally ethical issue. Thus, with these new technologies, Sorma Group also shows its commitment in the fight against food waste." The new SmartClass function makes it possible to automatically adjust the sorting potentiometers. After capturing several samples of the fruit, the machine is able to recognize the class to which the product belongs, thereby considerably reducing the time that would be used in the creation of specific programs for the identification of the varieties. Over the past few years, Sorma Group has been fine-tuning SormaTech's services, further improving the version that was already awarded the 2017 Macfrut Innovation Award bronze medal, further increasing the software's computational capacity. The result of this improvement, together with the Group's presence in many places, allows it to offer a unique pre- and post-sale service. "Sorma Group has always been characterized by its promptness in responding to the needs of its customers, thanks, above all, to its great network of branches across the world, which ensures a fast and efficient technical assistance service," says Daniele Fabbri. "Thanks to SormaTech, we are now able to provide flexible solutions in each of the post-harvest stages, from selection to packaging."